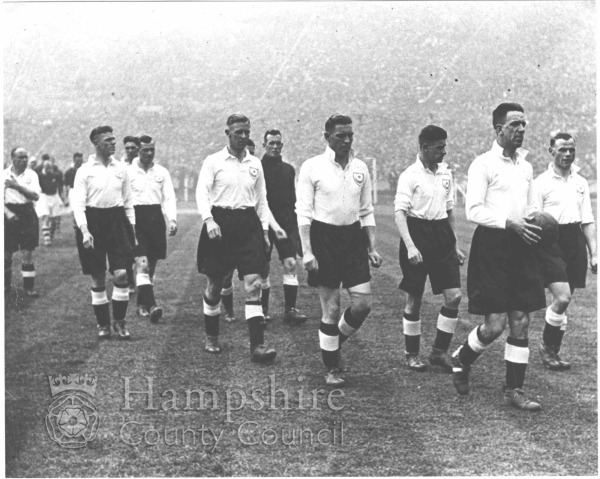 Pompey team coming out for the cup final on Saturday 28 April 1934. Five years and one day after three disappointing first Wembley appearance Pompey were to face Manchester City in the FA Cup final. Pompey playing in white shirts and black shorts where in the lead at half time, but Manchester City went on to win the game 2-1.93,258 people watched the game at Wembley.Portsmouth Football Club was formed on the 5th April 1898 at 12 High Street Portsmouth. Five businessmen purchased land close to Goldsmith Avenue for a football club and Portsmouth Football Club was born.The five men were John Brickwood, head of Brickwoods Brewery, George Oliver, founder of a local private school, Alfred Bourne, architect and surveyor, John Peters, a local wine importer and William Wigginton a governmental contractor.copy photographRef; Jeffs, P. Portsmouth Football Club 1898-1998.